The Alaska Department of Transportation and Public Facilities (DOT&PF) was recently alerted to concentrations of Per- and Polyfluoroalkyl Substances (PFAS) exceeding the state action level for drinking water in several wells located at and near the King Salmon Airport. Nine wells were sampled on or near airport property. Of the nine wells, one well located on airport property tested above the action level of 70 parts per trillion (ppt) for the sum of five PFAS compounds. The other eight wells had concentrations well below the action level of 70 ppt for the sum of five PFAS compounds. The Alaska Department of Environmental Conservation (DEC) began initial sampling of private water wells near airport property in December. 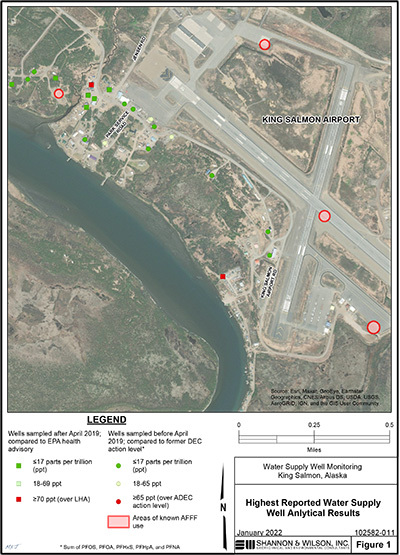 Shannon & Wilson, Inc. sampled 20 drinking-water wells at residences and businesses on or near the airport for the presence of PFAS in the groundwater from March 14-19, 2019. PFAS were found in 17 wells, two of which had concentrations above the DEC action level. Three wells had no detections of PFAS. DOT&PF and Shannon & Wilson, Inc. began contacting community members to notify them of their results April 9, 2019. Those who participated in the sampling event will receive a copy of their results at the mailing address they provided. If you have questions regarding sample results please email airportwater@alaska.gov.